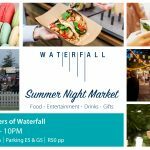 Immerse yourself in the most beautiful outdoor market in Johannesburg. 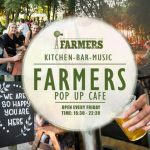 Located on the original Fourways Farmstead, you’ll enter under our pine tree canopy, down the flower-lined path and through to our haybale picnic lawn. A wooden signpost greets you where the only decision you’ll be forced to make is “Coffee to the right?” or “Eats to the left?” Saunter past the bees buzzing in the rose and lavender garden and you’ll enter our vibrant market aisles. Deliciousness awaits! Our carefully selected community of vendors offer divine and diverse gourmet delights to tempt you for breakfast or lunch. There is an incredible selection of locally made cheeses, cured meats, sweet treats, jams, freshly squeezed juices, preserves and finally, beautifully handcrafted jewellery, clothing and furniture. With a choice of seating- under the Jacarandas, in the Maypole Ribbon Marquee area, amidst the beautiful plants in our garden watching the children play or simply having a picnic on the lawns whilst listening to the best local music – you’ll be hard pressed to find a more relaxing way to spend a Sunday in central Fourways. You’ll be transported away from suburbia, into a vignette of yesteryear country markets. Surrounded by birdsong and butterflies, sipping a craft beer whilst being watching children run free, you couldn’t be further away from the City. We promise to change your Sundays forever. Landscape Architect and Horticulturist Greg Straw created the Fourways Farmers Market in 2013. Greg’s vision was to own a beautiful community gathering place where local, small-business owners and artisan’s could sell to the public. Our food vendors are hand picked to represent the very best in Jozi and create a variety of tastes and flavours that perfectly represent our rainbow nation. Whether it’s hot mielies, Indian food, Argentinian steak, Balkan Burgers, Cajun Goujons, Middle Eastern Mezze, or a local artisan baker or jam maker, each vendor has a passion for their product and their customers. The freshness and variety of our food will make your mouth water. Our crafters and artisans all produce or source innovative, beautiful and hand-made crafts that are uniquely local and not found in mainstream malls. Stroll through the market with your family and pets and meet your makers. With his roots in landscape architecture, horticulture, botany and farming, Greg is committed to the environment and we have recently partnered with Green Solutions to ensure that our market maintains the highest standards of environmentally sustainable practices and that we limit our impact on the earth. We proudly promote recycling and our waste is managed and recycled every week. We encourage all of our vendors to use environmentally friendly packaging. Please bring your own bags and baskets to assist us in our mission. There is ample seating on either our wooden benches or our famous hay bales or you can find a shady patch of grass and spend your Sunday soaking up the market atmosphere.